THE WONDERS OF TEPOTZOTLAN, EDO. DE MEX. Tepotzotlán is one of the most beautiful cities in the state of Mexico, it is accessed from its territory is remarkable to see workers and blacksmithing workshops cabinetmakers who come from the best crafts of the entity. which are former Jesuit colleges of San Martin and San Francisco Javier is housed, clear examples Churrigueresque Baroque of the eighteenth century, the last of these become the National Museum of Viceroyalty. In addition to the sights you can visit in this summer holiday include beautiful landscapes such as those that can be seen in the ecological niches, one of which is known as the Arches of the site, which has 440 meters long and is dedicated to the protection and ecological conservation, in addition to the aqueduct Xalpa. This site is one of the most famous and visited Tepotzotlán, consists of the former Jesuit College of St. Martin and St. Francis Xavier Church of St. Peter the Apostle, atrium of olive trees, cloister, hospitality, orchard, houses the mill, Chapel of the novices, the camerín of the Virgin of Loreto. The Church of St. Francis Xavier and his court were built 1610-1740, while the facade and tower of this majestic museum are outstanding examples Stipe Baroque eighteenth century, also known as Mexican Churrigueresque, these were built 1760-1762 . Inside a number of carved wooden altarpieces protects braised cedar leaf of pure gold, which were prepared in 1753 to 1755, works that are owed to teachers Miguel Cabrera, painter and engraver Higinio Chávez, so they are considered the most important in the world. The facade of the temple worked on the original eighteenth century and is built in two parts and cut chiluca stone finish gray where sculptures on three main issues are observed, the first is the lower body, which represents the glory of martyrdom of the first Christians, the doctors of the church and evangelists are also seen; while the second will distinguish the center window of the choir and the image of St. Francis Xavier, patron of the Jesuit church among other saints of various religious orders such as to indicate the spread of Christianity. Not forgetting the kick of San Miguel Archangel and the Virgin Mary. 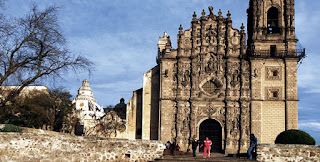 Also it is known as the temple of San Francisco Javier, now the National Museum of Viceroyalty. Its facade is one of the most representative samples of the eighteenth century Churrigueresque. 2. Center for ecotourism and environmental education "Arcos Site"
In Tepotzotlán State Park, the state government of Mexico gave 54 hectares for the protection and conservation of natural, historical and tourist resources of the municipality. Here is a monumental aqueduct eighteenth century that is called Site Arco, and is presumably one of the highest in the world, and that can measure more than 61 meters. Construction began in 1706 and was completed in 1854 on the orders of the Count of Regla. The Environmental Education Center provides for the enjoyment of visitors, facilities such as zip, palapas, grills, small lake for rowing, horse rentals, bridges, gazebos, playgrounds, restrooms, restaurants and parking. In Tepotzotlán the atmosphere a colonial environment represented by its central square is adorned with the presence of the magnificent Jesuit College, now the Museum of the Viceroyalty and the unique church of San Francisco Javier, which retains its splendor alongside the traditional kiosk and paved garden breathe where they converge the cobbled streets of the town. Around the square are the portals and restaurants that invite us the delights of traditional cuisine. This place consists of beautiful gardens surrounded by flowers with a special area for camping, places to eat and extensive cycling and skating. Among our many attractions, we have miniature golf, small boats, acuaesferas, eurobungy, climbing wall, train shows and tours. Visitors can also find ping-pong tables, volleyball nets and goals for fun playing. It has fences that delimit its length, controlled access, security service with park rangers and CCTV 24 hours, providing a safe circuit. Besides families have the opportunity to contribute to the environment as revenues obtained by park admissions, services, income of attractions, selling food and products destined to the development of environmental projects and conservation of this green area Urban. Therefore, the natural beauty of the park with its attractions and services, make this area a unique place within the municipality of Tepotzotlán. With sales of Mexican dishes as pambazos, quesadillas, sopes and tacos, this place is the best known in Tepotzotlán, where also the most crowded in the barbecue and the carnitas. However, the exotic food is something that most people like to try, from the kid, even insects like grasshoppers, snails and Escamoles latter prepared at the Inn of the Convent.